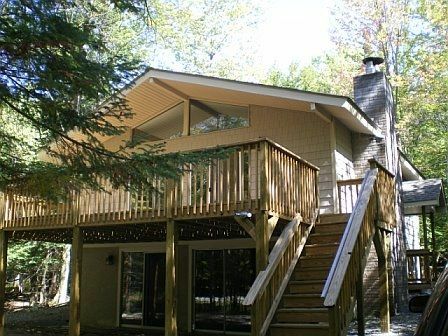 We have a Wonderful 4 Bedroom, 2 Bathroom house that sleeps 10+ available for rent in the Pocono Mountains! If you are looking to rent a place with your Friends, or with your Family, then this is the place for you. This property has a great amenities, including: a Bar (liquor not provided), Flat Screen Televisions, WIFI and a BBQ! Within the community you have access to 6 lakes, 9-hole Golf Course, Ski Hill, New Sports Complex, Basketball Courts, Baseball Fields, Tennis Courts, 2 Pools, 2 Beaches, and Mini Golf. Outside of the community you will be in close proximity to White Water Rafting, Horseback Riding, Water Parks, Paintball, ATVs and so much more. We have a Standalone AC unit in the upstairs living room/dining room area in addition to fans in all the rooms. Stand Alone AC just added this summer for the upstairs dining/living room area!!!!! We also have fans in all the bedrooms. I liked the property but the people at the front desk when you check in are a bit rude at first. The house is a decent size and it's pretty spacious and more modern than most other properties we saw. The house had some linens but the beds weren't done and they're weren't enough linens. You also have to take the trash to a location about 1 mile away. There are a lot of amenities but the pool and chairs - include fees even for residents. The owners did answer when I called but they answer much quicker via email and were helpful when I asked questions. We enjoyed our stay here. First night we encountered a fridge on the fritz & a defective coffee maker. Owners were responsive and rectified everything in 24hrs. This house has plenty of space inside and a good sized deck. The charcoal grill needs to be replaced. The handle on the grill top was broken & eventually the remaining pieces broke off. Close spot to the Main Lodge & Brooks Lake. Brooks Lake is a hidden gem for fishing. I really enjoyed the stay at the house. Very relaxing and comfortable. After experiencing staying in a private community as, my family and me really had a great time. I like the fact that it's gated with security which makes it safe for the kids/family members. On site the community has so much to do. They offer skiing in the winter, biking, they have a pool and other water sports. Kids will never get bored and will always be safe. My family and me took the time to drive around looking at the houses and hopefully in the future we will own a house of our own. Thankyou very much for a great/safe stay. Overall our stays been a memorable one and the house was good. But we would like to point out some keynotes to improve the quality of the stay for future renters. 1. There is no bolt in the upper restroom. 2. There is a small leakage in the kitchen sink. The Property is located in the wonderful Hideout Community, one of Pennsylvania's 4 Star, 4 season communities. It is within 45 minutes of four ski resort areas for winter fun, and only seven miles from Lake Wallenpaupuck, Pennsylvania's largest lake. Besides all of the wonderful activities that are right on the property and the community, local attractions provide entertainment for all ages. There is horseback riding only 2 miles from the property, and an interactive zoo 3 miles away. Paintball fields, Water Parks, and ATVs are also near by.